The Augusta Sportswear 423 50/50 Short-Sleeve Raglan T-Shirt uses serge technology to efficiently produce raglan shirts for the whole team, at a price-point advantage that matters most when you are buying in bulk. As opposed to a traditional coverstitch, the serged fishtail bottom of these shirts have been cut, sewn, and finished all in one step. This gives each shirt a polished, professional look that is accentuated by the sleeves and 1x1 rib knit collar in crisp, contrasting colors. 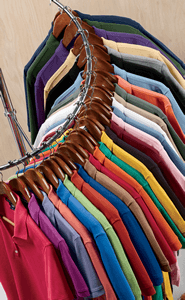 Cotton knit jersey feels great, is naturally breathable, and draws moisture away from the body, while polyester works hard to retain color, evaporate moisture and resist wear, making this shirt ideal for athletic apparel as well. Unlike 3/4 sleeve variations, this classic short-sleeve garment is ideal for warm summer wear when you desire to be at your coolest.